The idea of a shock absorber which could be adjusted between soft and hard settings, went back to the 1930s, when Girling Luvax brought out their pressure adjustable system. The system wasn’t particularly successful and was withdrawn in 1939. 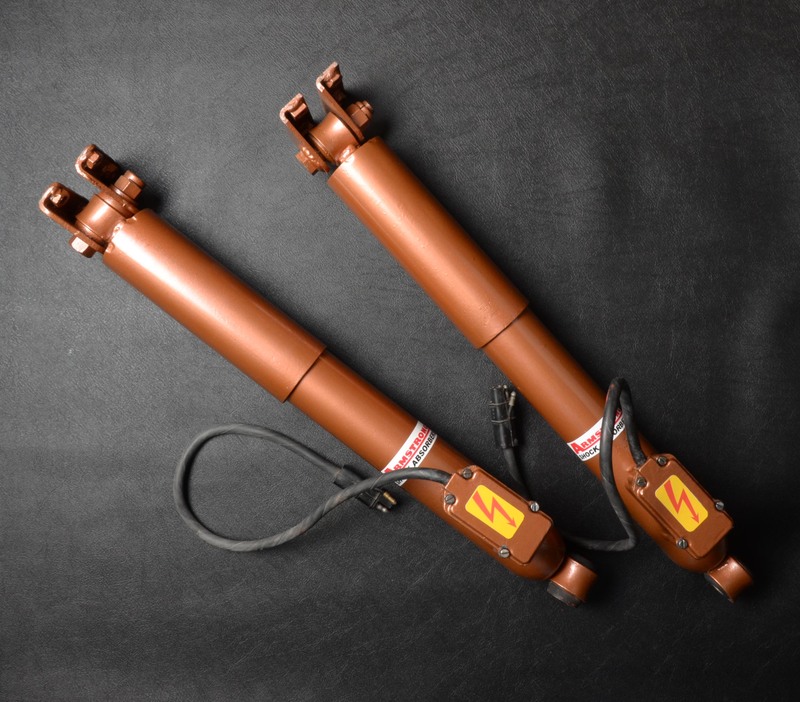 It was Armstrong that paved the way post-war, developing an electrically adjustable shock absorber which they fittingly called the ‘Selectaride’ and which was patented by them in 1961. Armstrong’s ‘Selectaride’ could be adjusted by means of a switch mounted inside the vehicle and had four settings between soft and hard. The ‘Selectaride’ shock absorber had an additional metal box welded to the side of the unit, which housed the electrical unit. 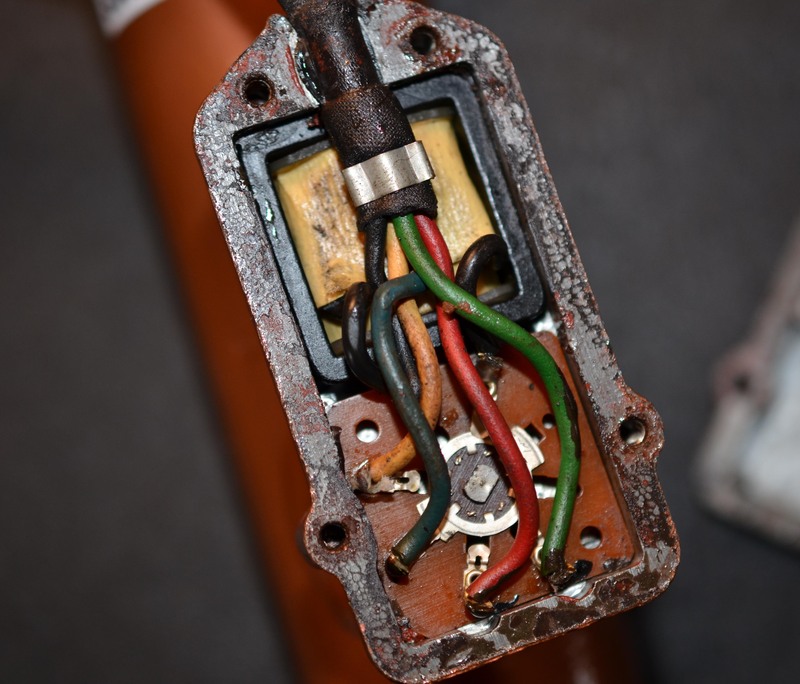 The front of the unit was screwed into place allowing specialist repairs if required, and with the front plate removed the viewer could see the four coloured wires ( yellow / blue / red / green ) going to the four contacts along with a black earth wire. Jensen Motors liked the idea of the electrical adjustable shock absorber, and when the CV8 was revised in 1963, the new MK.II version of the car was equipped with ‘Selectaride’ shock absorbers to the rear. The ‘Selectaride’ shock absorbers continued to be fitted to all CV8 MK.II / III cars, and also to all MK.I Interceptors and FFs. Unfortunately there were problems with the ‘Selectaride’. Firstly, the four contacts within the unit were small, delicate, and given to untimely failure. In addition, the ‘Selectaride’ could suffer from voltage drop caused by any number of bad earths on the car. Both, contact failure and voltage drop could cause one ‘Selectaride’ to remain, on say a soft setting, whilst the other, might still be working and end up on a hard setting. Once out of synchronisation with each other, the chances were, that is how they would remain. With mounting warranty claims, Armstrong decided to withdraw the ‘Selectaride’ shock absorber from their range, and sold off the rights to the Japanese concern, KYB in the 1970s. 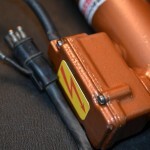 With a revised mechanism, their version of the ‘Selectaride’ was fitted to various cars including Honda. However, even the revised and ‘improved’ version wasn’t without problems, and like Armstrong, KYB finally deleted the electrically adjustable shock absorber from their range. Back in Great Britain, and with the demise of the ‘Selectaride’, Jensen Motors had no other option but to fit standard non-adjustable shock absorbers to their cars. The non-adjustable shock absorbers were fitted to all MK.II Interceptor and FFs, and all subsequent cars. 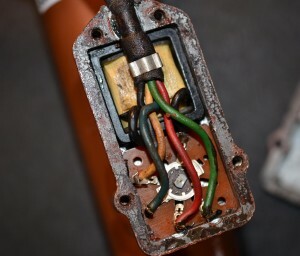 Close-up of the electrical box, with connector. The earth lead comes out of the connector side. Rock musician, Ginger Baker, owned both a Jensen FF MK.I and MK.II. He was a definite fan of the ‘Selectaride’ shock absorber. Letters between himself and Richard Graves at Jensen Motors, outlined that in his opinion the road holding was far better on the MK.I than his MK.II. Baker put this down to the ‘Selectarides’ on the MK.I, which on setting 4 he found made a marked difference. Baker went on to say it was a shame ‘Selectarides’ were not continued on the MK.II – obviously unaware that Armstrong had deleted them from their range. Electrical box with front removed to expose the four setting wires & contacts. Forty years on, it is still possible to re-condition the ‘Selectaride’ shock absorber, and specialist companies such as Steveson Motors (Birmingham) will undertake this work. 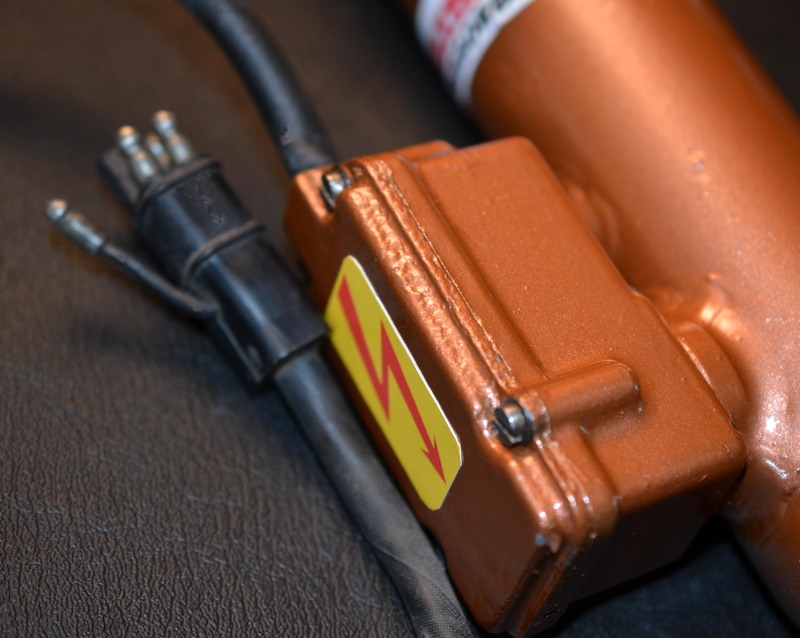 However, Derek Steveson of Steveson Motors advises that the earth to the plug connector of the re-conditioned units is left disconnected to save the possibility of the two shock absorbers running out of synchronisation with each other. For the future, Steveson Motors is looking into two possibilities for the ‘Selectaride’. Offering a revised and better quality contact set, which should dramatically reduce the chances of the shock absorbers running out of synchronisation. Or a more simple alternative, whereby each shock absorber can be adjusted by twin switches mounted discreetly in the boot area. Whatever the long-term outcome, at least those who worry about such things, can still carry re-conditioned ‘Selectarides’ on their CV8s and MK.I Interceptors / FFs. ACKNOWLEDGEMENTS: Our thanks to Derek Steveson with help in preparing this article.